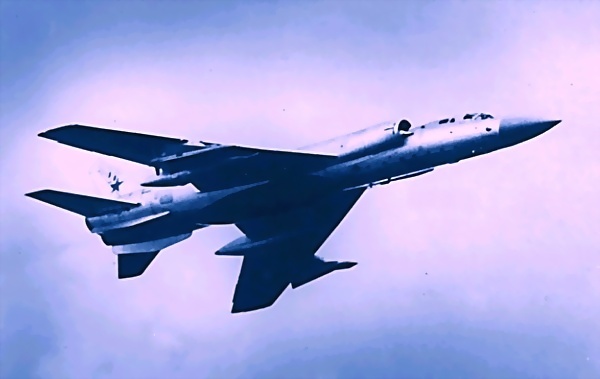 The Soviet Union had a long and illustrious history building large, unconventional aircraft, both bombers and fighters. The amazing Tu-128 was another example in that long line of designs. The Tu-128 was developed in the late 1950s with the primarily mission of countering the perceived threat of America’s new heavy bomber, the massive B-52 as well as the US Navy’s A-5 Vigilante and the proposed US Air Force’s B-70 supersonic heavy bomber. The Tu-128 Heavy Interceptor design concept was directly influenced by the unsuccessful Tu-98 Backfin bomber project. Due to the specific nature of the 128, NATO codenamed Fiddler, mission profile; the interception of America’s bomber fleet before it could reach Soviet airspace, the aircraft needed to be huge in order to carry the massive R-4 long range, air-to-air missiles (NATO designation AA5-Ash) that could strike an incoming target nearly thirty seven miles away. The developmental phase of the Fiddler began in the mid 1950s and ran well into the early 1960s. What emerged was truly a revolutionary military aircraft. The aircraft was manned by a crew of two. They entered the 128 through an 11 rung ladder. The cockpit was pressurized. The cockpit was protected by a heavy upward hinged metal canopy fitted with a bullet-proof, V-shaped windscreen. Two KT1 ejection seated were installed as a safety measure. The nose cone housed the RP-5M Smerch-M Fire and Control Radar System. A receiver antenna was fitted in a large ventral fairing for target echo reception. The avionic package, state of the art at the time, was housed in the lower-front section of the airframe. The package contained the advance AP-7P autopilot system, the NvU-B1 navigational computer, and the Put-4 flight control system that gave the Tu-128 semi-automatic level flight guidance, airfield homing capability, altitude heading hold, and automatic runway approach numbers. Eight fuel tanks were housed in the centre of the airframe. They gave the 128 a total of 32,739lb of fuel capacity. Four massive under wing pylons were used to carry the R-4T infrared and later, the R-4PM radar-guided air-to-air missiles. 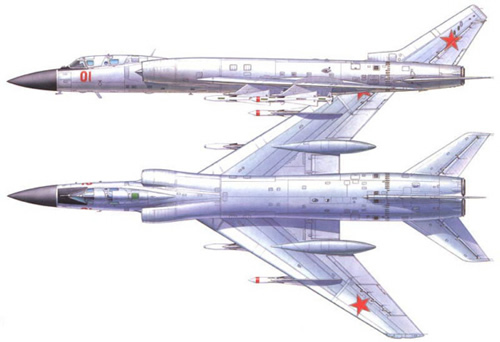 The 128, as was the case with the Tu-22 bomber, had its main undercarriage retract backwards into a huge wing trailing edge, bullet fairings. Around two hundred Fiddlers were built. They were used in front line service by the Soviet Union’s Home Defence Fighter Force (PVO) and its Frontal Aviation Air Regiments (VVS). Five variants of the 128 were produced. The original Tu-128 Heavy Interceptor, the Tu-128A, the Tu-128UT trainer unit, the Tu-128CH, and the final variant, the Tu-128M. The Fiddler entered front line service with the PVO in the autumn of 1961. It performed its principal mission profile well into 1988, when the aircraft was finally retired from active service. By the mid 1990s, some Tu-128 examples were still flying, mainly training missions and/or target tugging duties. The last version to enter service, the Tu-128M entered service in the spring of 1979, is still active with some of Russia’s regional air commands. Only about five to fifteen units remain airworthy as of today. Still flying almost half a century after originally conceived, the Tu-128 is one of the world’s most amazing aircraft.